Please be informed that Performance Management & Delivery Unit (PEMANDU) in collaboration with Pembangunan Sumber Manusia Berhad (PSMB) will be organizing Minimum Wages Clinics: Towards Successful Transition and Enhancing Productivity. The objective of this event is to communicate on how to implement the minimum wage, financial aspects and the available assistance for SMEs to transition and enhancing productivity. The event will also provide training for workers to increase productivity. 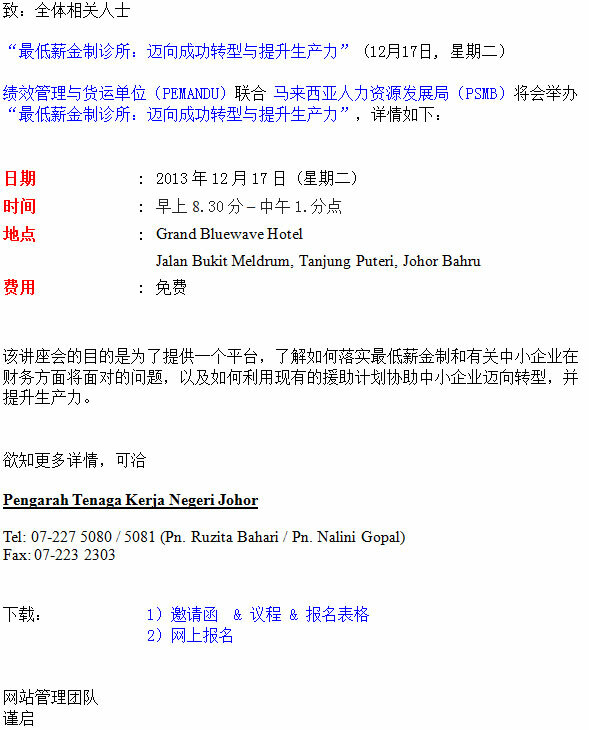 Copyright 柔州中华总商会 2008-2010 Johore Associated Chinese Chamber of Commerce and Industry. All rights reserved.